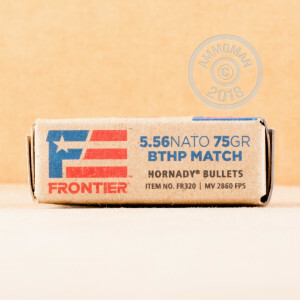 Hornady produces their Frontier line of ammunition via state of the art loading techniques, and they scrutinize their work according to stringent quality assurance procedures to ensure both its reliability and outstanding performance. It features factory fresh brass casings along with military grade propellant and Boxer primers, making it admirably consistent in addition to fully reloadable. This 5.56x45 cartridge sports a 75 grain match projectile, so it has the inherent accuracy needed to impress those scoring your aim or just to meet your own high standards. The bullet’s boat tail design significantly improves its ballistic for even better accuracy by granting it resistance to wind drift and higher retained velocity downrange, and its hollow point makes it as practical for hunting as it is for range training. 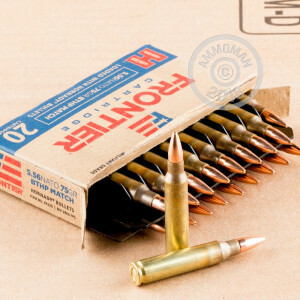 And because you’ve got the savvy to visit AmmoMan.com, you can order these 500 premium cartridges to your home with complimentary shipping and handling!